NEW 2018 MODEL – The Extreme Light Weight Balance Bike weighs in at just 4 lbs. 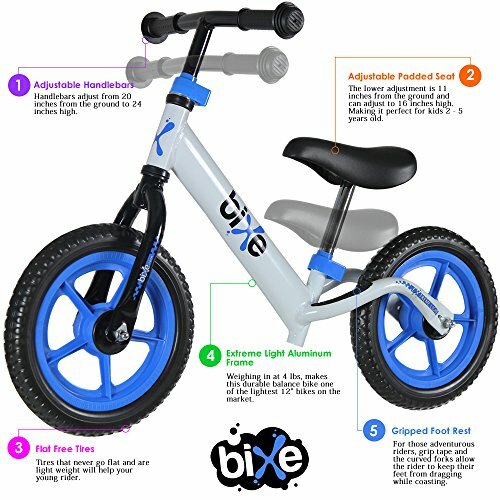 The all-aluminum frame and foam tires makes this one of the lightest balance bikes in the world. 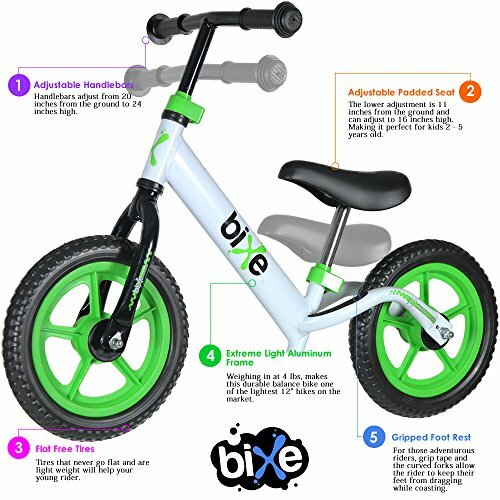 BALANCE BIKE DIMENSIONS – The seat adjusts as low as 11″ from the ground all the way to 17″ tall. The handle bars will adjust from 20″ at the lowest point to 24″ tall, making this the best option for young beginners learning to ride a bike. WARRANTY – If you are at all not satisfied with the bike, or even the results, please let us know. 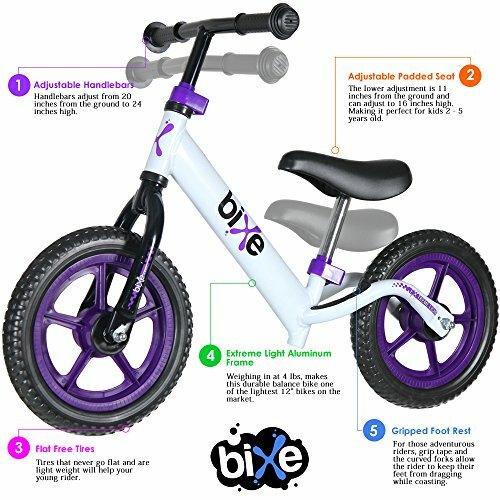 We will 100% buy back the balance bike from you. With the 100% guarantee, we will fix or replace defective parts as well. 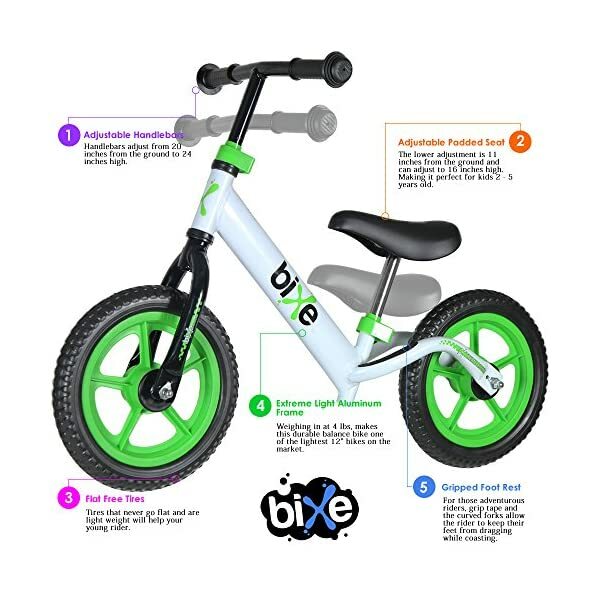 Bixe Balance Bikes are some of the lightest-weight balance bikes, making it easy for your beginners to train and carry their bike. Balance is the single most importance part of learning to ride without training wheels. 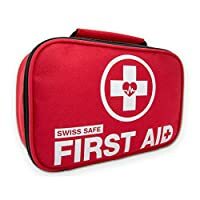 It is important that the child has complete confidence that they are in control of the situation. 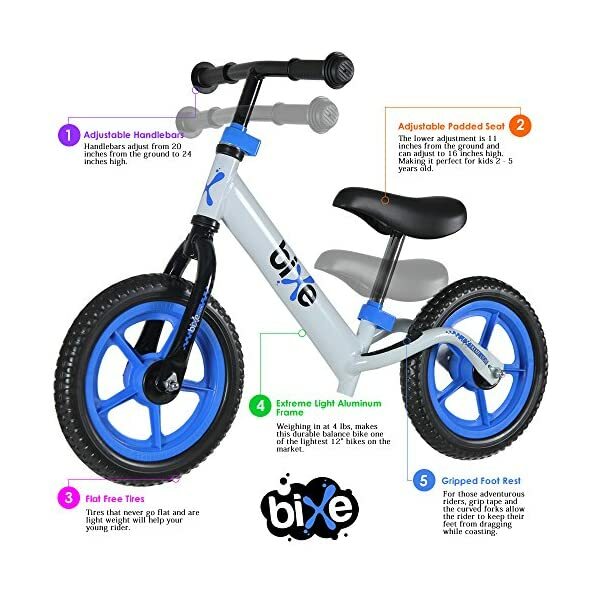 The Extreme Lite Balance Bike instills great confidence for riders 2-5 years old. SAFETY A MUST – Along with providing the best balance bike at the lowest cost, know that each bike is built and inspected with your child’s safety in mind. 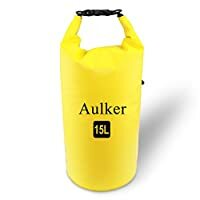 Each clamp is tamper-proof, both wheels equipped with safety washers and each frame build to far exceed the weight limits of even larger children. With rigorous testing with larger children, we are proud of the durability of the 2018 model. SIMPLE SET UP – Each bike comes partially assembled. The wheels are securely attached and ready to ride. Just slide the seat and handlebars in the right position for your child and clamp it down with the wrench provided.